Andrew Hughes in action for Peterborough United. Peterborough United defender Andrew Hughes today (June 21) completed his move to Championship side Preston North End. Hughes (26) has signed a three-year contract after the clubs agreed an undisclosed transfer fee. News of Preston’s interest in a player expected to play a full part in Posh’s promotion push next season came as a surprise. Posh had triggered a year-long extension in Hughes’ contract at the end of last season which enabled them to demand a fee for a player who cost nothing when arriving from Newport County two years ago. 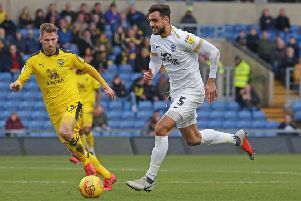 Posh manager Steve Evans said: “I went on record after a few games of me arriving at Posh and said that Andrew Hughes was equal, if not better, than anything in League One as a left-back, which brought debate both internally and externally.